This dashing Gucci ‘Marseille’ tuxedo, with velvet lapels and matching bowtie, was a hit. The handsome made-to-order tuxedo elevated the dapper musician with a classic. Grab a piano and get the party started! Photo by C Flanigan/Getty Images. This navy and black Prada tuxedo with black bow-tie set the standard for the younger, hip crowd hitting the red carpet. With many tuxedos sporting various shades of blue, Ansel brought a true breakout moment for fashion followers, who started asking, "Is blue the new black?" This custom Tom Ford tuxedo with a black grosgrain shawl collar stunned with effortless air. The final touch of black-faced watch was a great addition. 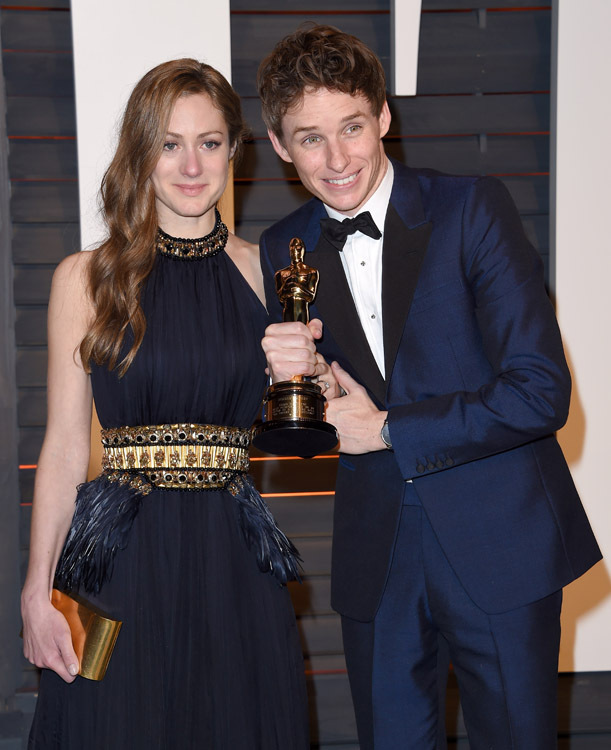 Winning Best Actor in 2015 for the “Theory of Everything”, Redmayne was a fashion force in this midnight blue Alexander McQueen tux with Chopard accessories. Tatum shined in a Dolce and Gabbana black shawl tuxedo, Louis Leeman shoes and Neil Lane cufflinks. Perfectly tailored with that classic old Hollywood appeal, we especially liked the pointed pocket square. The actor who we know best as a classic comic book hero looked polished in a midnight blue Gucci ‘Marseille’ peak-lapel, one-button tuxedo. Pine walked the carpet in an Ermenegildo Zegna tuxedo in 2013 with a crisp bow tie that he untied for a relaxed after-party arrivals. 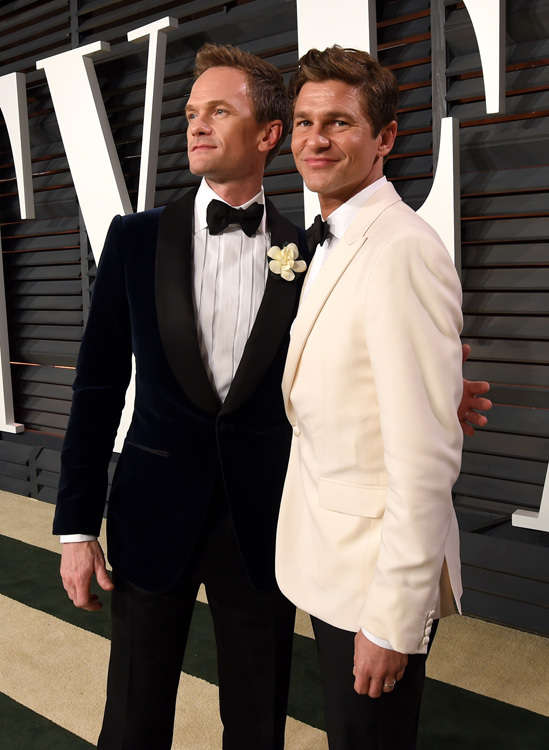 The Imitation Game star made a serious statement breaking away from the pack with this shawl-collar white tuxedo. The black pocket square detail was a standout. White was on trend this year with Adrien Brody, Eddie Murphy, Jeff Goldblum all on board. 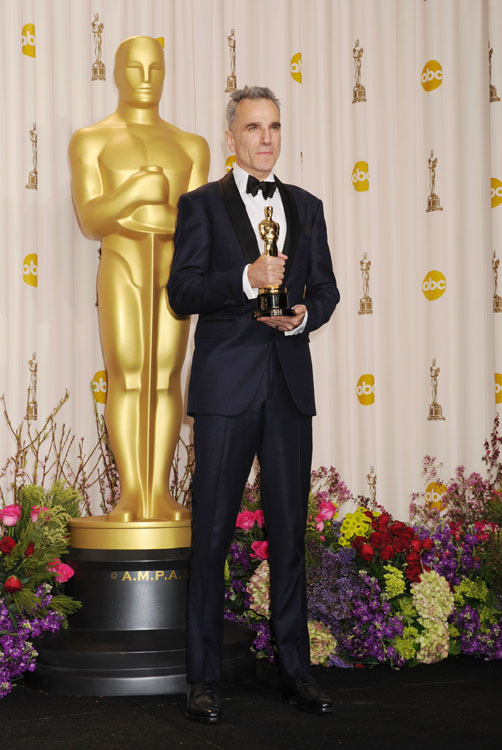 The fashion forward actor sported multiple looks for the evening as presenter of the Oscars. 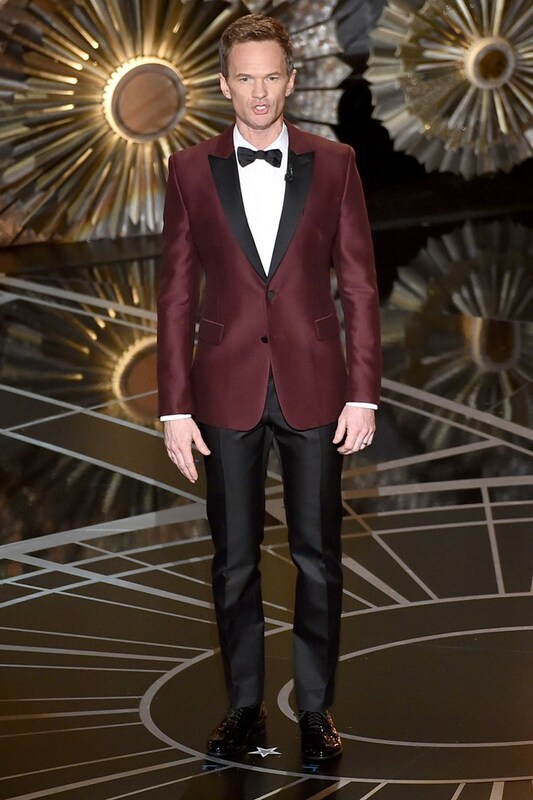 He walked the red carpet in a single-breasted, gray wool/cashmere flannel shawl-collar tuxedo and matching gray flannel bow tie by Italian luxury brand Brunello Cucinelli. Moving into the evening, Harris sported this custom burgundy two-button tuxedo jacket with black peak lapels and black tuxedo trousers by Italian luxury label Valentino. Moving to the afterparty, Harris donned this navy blue shawl-collar classic tuxedo by Tom Ford. The shirt makes the statement, with beautiful lined detail accenting the timeless swanky bow-tie. Photo by Larry Busacca/VF15/Getty Images. 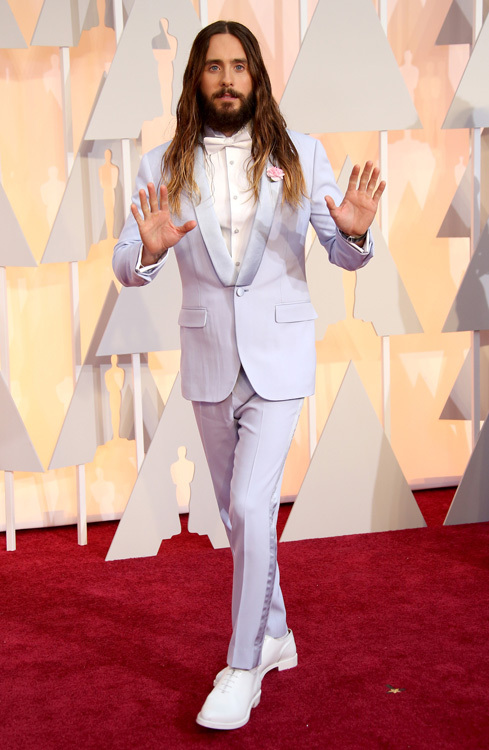 Leto, known for careers in both music and acting, is not afraid to add a little panache to the red carpet. His softer blue Givenchy tuxedo was a standout. 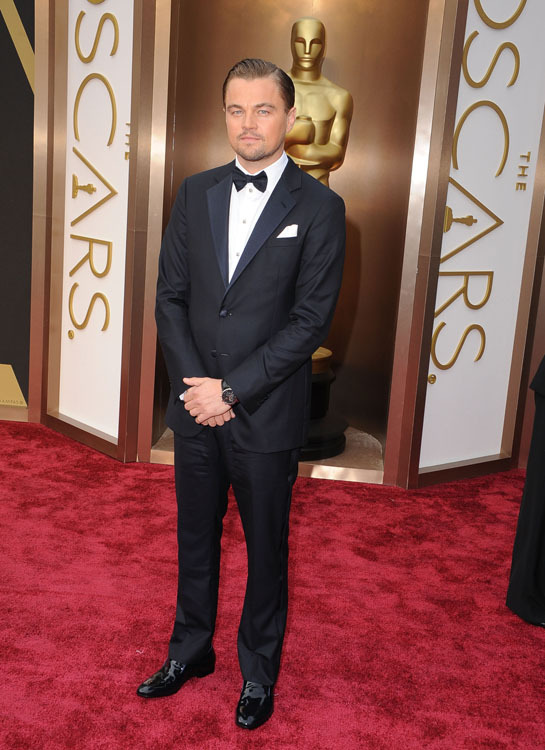 In 2014, DiCaprio may have missed grabbing an Oscar statue, but thanks to his classic Armani tuxedo, he looked like a winner. In 2014, Spacey stepped out in a Burberry tuxedo that went one step further than midnight blue, with an accented black lapel that helped pull the tuxedo together for a camera-ready look. 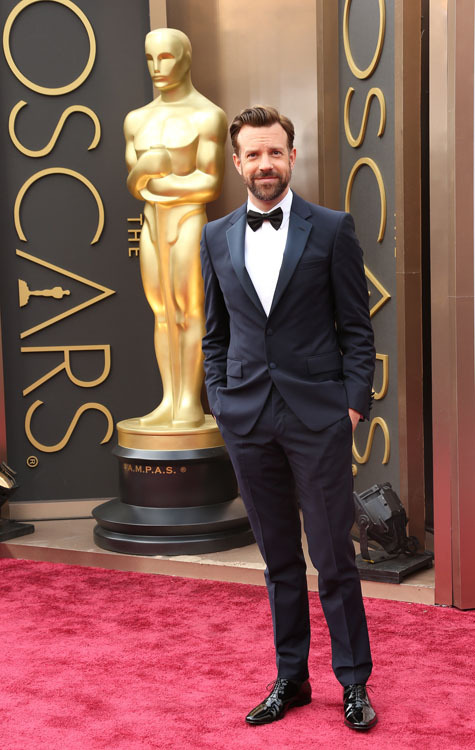 The We’re the Millers actor made his presence known with his classic Prada tuxedo in classic navy and simple bow-tie. Simplicity is sometimes the key! In 2014, the American Hustle star turned up in a peak lapel Tom Ford tuxedo, black shirt studs, white-faced dress watch, and patent leather shoes. Poppin'! In 2014, the Rush star wore a stunning deep plum David August three-piece tuxedo with an accented black lapel, along with a statement Montblanc watch. The pocket square added an extra bang to the classic look. 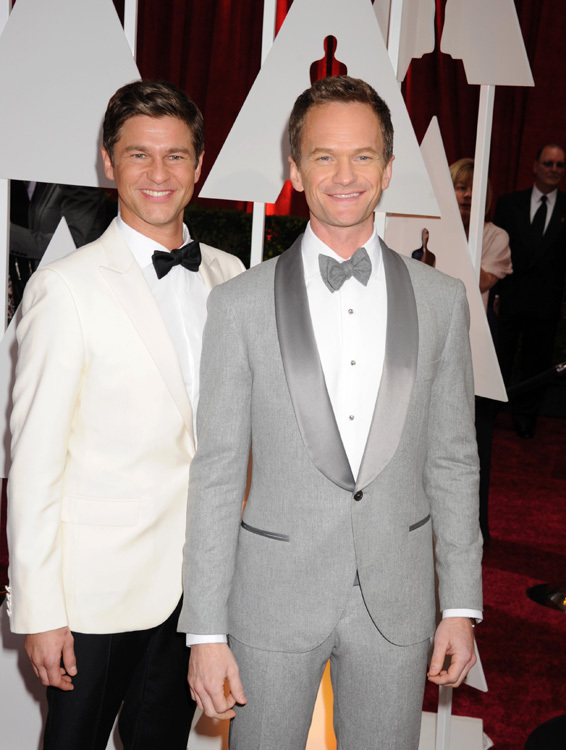 Nominated for the movie Lincoln, Day-Lewis walked the carpet in a tuxedo custom-made by Italian designer Domenico Vacca that featured shawl collars in grosgrain rather than classic satin. A confident classic!